Pregnant women often experience cravings for certain types of foods, yet it can be discouraging for a pregnant woman to hear that not every food is safe to eat during pregnancy. Certain types of cheeses are safe during pregnancy, while others need to be avoided. Cheese is also rich in protein and calcium, which pregnant women need. Pasteurized mascarpone cheese can be consumed in pregnancy. Mascarpone cheese is an Italian soft cheese that is most often used in recipes for foods like lasagna and casseroles. It adds a creamy consistency to recipes so it can be used to replace cheeses like cottage cheese or ricotta. Mascarpone cheese is the main ingredient in the Italian dessert tiramisu. Certain cheeses can harm an unborn baby when consumed by pregnant women. The website Baby Centre, which specializes in issues about pregnancy and parenting, explains that cheeses which are ripened with mold such as Brie or Danish Blue cheese should not be eaten by pregnant women, as the mold can give her an infection called listeria. Soft, unpasteurized cheeses like goat cheese and Chabichou can also cause foodborne illness in a pregnant woman. Most people can get over foodborne illnesses in a few days, yet if a pregnant woman gets one, it can harm her unborn child, according to Baby Centre. Mascarpone cheese is one of the many cheeses which is safe for pregnant women to eat. 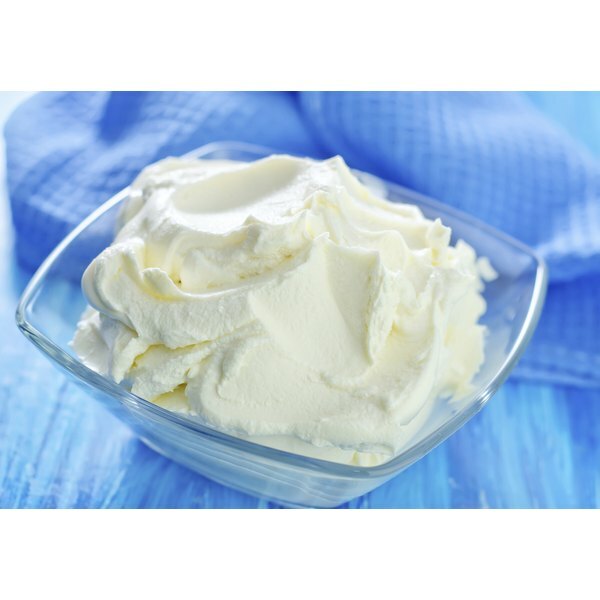 Mascarpone is not ripened with mold and it is pasteurized so that it contains very little risk of harboring bacteria. Additionally, hard cheeses such as cheddar, mozzarella and Swiss cheese are also safe to eat during pregnancy, according to Baby Centre. The process of pasteurization is what destroys bacteria in cheeses and prevents it from causing foodborne illnesses like listeria. Pregnant women are 10 times more likely to get listeria, and pregnant Hispanic women are 24 times more likely, according to the Centers for Disease Control and Prevention. Listeria infection during pregnancy may lead to illness of your infant, pre-term labor, miscarriage or stillbirth. CBS News explains while the pasteurization process does make the taste and scent of cheeses milder, it also heats up the cheese and destroys bacteria such as salmonella and E. coli. The process of pasteurizing cheeses makes it safe for pregnant women to eat. Cheese can provide numerous health benefits to pregnant women, when eaten in moderation. The Center for Young Women’s Health explains that cheese is rich in the mineral calcium, which helps to strengthen the bones and prevent osteoporosis. Cheese also contains protein, which provides energy and spares muscle mass. The nutritional database FoodNutritionTable.com states each 1-ounce, or 28 gram, serving of mascarpone cheese has 1.4 grams of protein. Because nutritional requirements increase during pregnancy, it is essential to eat nutrient-dense foods like mascarpone cheese. Baby Centre: Which Cheeses are Safe to Eat When You're Pregnant, and Which Aren't? CBS News: Unpasteurized Cheese: Delicious But Is It Safe?